This is the recipe for my default toe-up socks. I particularly like this pattern because it has my favourite features of toe-up socks (knit until the yarn runs out, try on as you go, and no grafting) but also my favourite feature of top-down socks (heel flap and gusset). The sock is reinforced with a slipped stitch pattern both on the back and the bottom of the heel, so it’s super protected against holes. 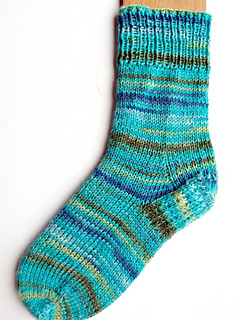 This pattern is designed for a person who has knit a few socks before and wants to try to a new construction. The pattern is not written for a specific gauge -- you are meant to try the sock on as you go to get a perfect fit. That said, all the numbers are written out -- there is a choice of 4 stitch counts for the foot and with an average sock yarn, one of those stitch counts should work for you. But tips are given throughout for using your own numbers and I’m happy to answer any questions.